Look! I sewed something! 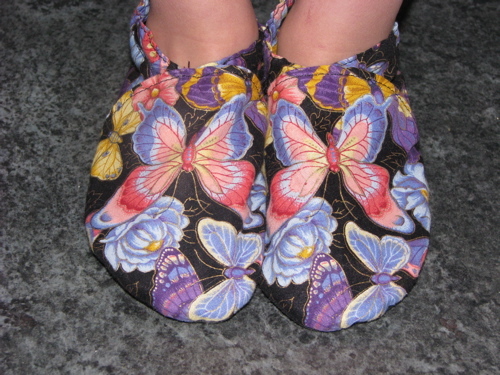 The girl saw a pair of baby slippers that have been hanging around and asked again for slippers of her own. (Even though she doesn’t wear the ones she has.) So I dug through the drawer that has my baby slipper supplies. I used to make quite a few of them, even drafted my own patterns in sizes from newborn to 4/5. I found this colorful butterfly print all cut out and ready to sew. I cut out the suede soles, (normally I would use leather for toddlers with bare floors) and sewed the uppers together. I had to rip and resew about three times because I’ve forgotten how to assemble these, as simple as they are. But she’s happy with them and has actually been wearing them yesterday and today. Usually I make these in heavier fabrics for winter use or line them in fleece but since it’s summer I decided to leave the extra layer out. Those are slippers fit for a princess! How Sweet! 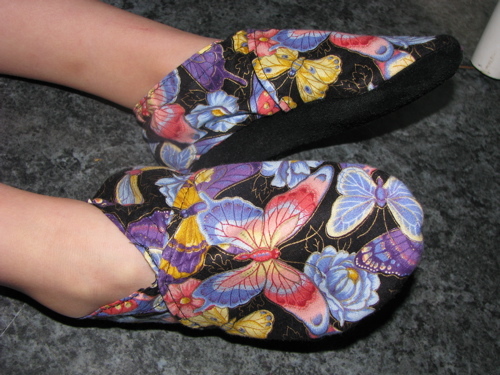 I never have the patience for slippers, your slippers are so well made!